APSLPRB AP Police Constable Final Written Test Answer Key 2019, Raise your Objections: Andhra Pradesh State Level Police Recruitment Board (APSLPRB) has released the Answer key for the final written examination (mains) on its official website slprb.ap.gov.in. The exam was conducted on March 17, 2019. Candidates can check the answer key and match it with their OMR response sheets from the official website. The last date to raise any objections against the answer keys of APSLPRB is March 20. After considering the representations, the board will release the final answer key later. The objections on the answer key shall be sent before 5 pm on March 20. The objections can be addressed in the following format and sent to the email ID- apslprb.obj@gmail.com . The final written test was conducted for the post of SCTs PCS civil and AR (Men and Women) and APSP (Men), Warder (Men and Women) and firemen 2018. The preliminary exam for these posts was held at 28 locations at 704 centres in the month of January. A total of 3,46,284 candidates took the exam out of 3,92,785 who had registered. Step 4: Check your answers. 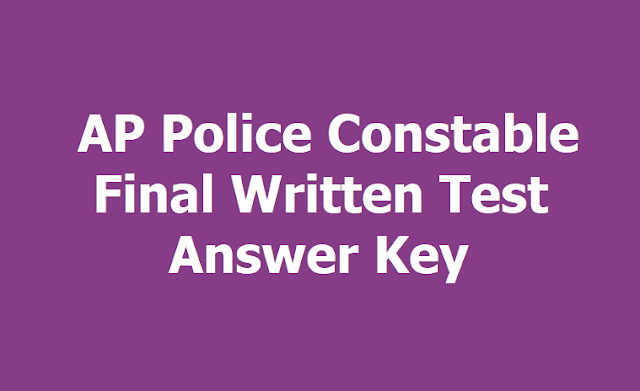 Please find attached Preliminary Key for Andhra Pradesh State Level Police Recruitment Board – 2018 examination for SCT PCs Civil (Men & Women), SCT PCs AR (Men & Women), SCT PCs APSP (Men), Warder (Men & Women) and Firemen Final Written Test conducted on Fore Noon session of 17.03.2019. The objections, if any, on the Preliminary key shall be sent on or before 20.03.2019 (5 PM). The objections can be addressed in the following format only to email id: apslprb.obj@gmail.com . The objections submitted in the any other format will not be considered.